The companion to the popular and award-winning A Hundred Billion Trillion Stars. 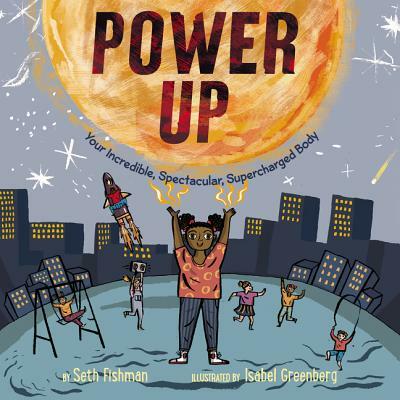 This captivating and educational picture book from Seth Fishman and Isabel Greenberg introduces young readers to basic facts about energy and the human body. Fun, informative and accessible, Power Up is perfect for classroom and family sharing. A great title to read along with Andrea Beaty’s Ada Twist, Scientist and Oliver Jeffers’s Here We Are. Did you know there is enough energy in your pinkie finger to power an entire city? And that everything you do—running, jumping, playing, and exploring—uses that same energy inside of you? In the companion to the acclaimed A Hundred Billion Trillion Stars, Seth Fishman and Isabel Greenberg explore the relationship between energy and the human body, breaking down complicated concepts into small, child-friendly segments. Seth Fishman’s playful text explores the science behind the most energetic kids, while Isabel Greenberg’s vibrant illustrations offer plenty for children to explore in multiple readings. Ideal for curious kids and classroom learning, this engaging book is for fans of Elin Kelsey’s You Are Stardust and John Scieszka’s Science Verse.